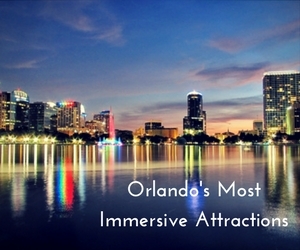 One of the most popular tourist destinations in the country, Orlando offers a getaway for millions of people each year. From virtual reality to escape rooms, a gamut of immersive attractions transport you to another world and make your vacation extraordinary. Here are some of our favorites! A long-standing icon in Orlando, Wonderworks is easily spotted on International Drive by the building’s upside-down appearance. Once inside, fun and excitement for all ages awaits. Team up for a game of laser tag, or take a virtual ride to the Great Wall of China. Everybody is sure to have a blast, and maybe even learn something along the way. You don’t have to be a professional golfer to have a great time at Topgolf Orlando. Set to open in fall of 2017, this multi-tiered venue will offer over 100 climate-controlled driving bays complete with TV displays and software that can track every shot. Show off in front of your friends, or perfect your technique to shave strokes off your game. Either way, you’re sure to have an unforgettable time. Team up with family and friends to solve real-life puzzles filled with clues, hidden messages, and secret compartments as you work against the clock at one of Orlando’s many escape rooms. You can stop the outbreak of a deadly pandemic at America’s Escape Game, or try your hand at solving the Cuban Missile Crisis at Escapology. The choice is yours, but you’re sure to have a blast! Orlando is the perfect place to relax and escape the dull routines of everyday life. When booking your stay in Orlando, remember that the Rosen Inn is located right on International Drive just a short distance from the attractions. Our affordable yet luxurious rooms give you the perfect place to recharge your batteries after a long day in the city. Contact us today to book your stay.